For the 18th-century Greek newspaper, see Efimeris. 1st millennium BC – Ephemerides in Babylonian astronomy. 12th century AD – the Tables of Toledo – based largely on Arabic zīj sources of Islamic astronomy – were edited by Gerard of Cremona to form the standard European ephemeris until the Alfonsine Tables. 13th century – the Zīj-i Īlkhānī (Ilkhanic Tables) were compiled at the Maragheh observatory in Persia. 13th century – the Alfonsine Tables were compiled in Spain to correct anomalies in the Tables of Toledo, remaining the standard European ephemeris until the Prutenic Tables almost 300 years later. 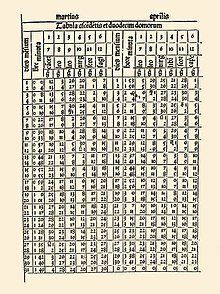 1408 – Chinese ephemeris table (copy in Pepysian Library, Cambridge, UK (refer book '1434'); Chinese tables believed known to Regiomontanus). 1474 – Regiomontanus publishes his day-to-day Ephemerides in Nürnberg, Germany. 1504 – While shipwrecked on the island of Jamaica, Christopher Columbus successfully predicted a lunar eclipse for the natives, using the ephemeris of the German astronomer Regiomontanus. 1531 – Work of Johannes Stöffler is published posthumously at Tübingen, extending the ephemeris of Regiomontanus through 1551. 1551 – the Prutenic Tables of Erasmus Reinhold were published, based on Copernicus's theories. 1554 – Johannes Stadius published Ephemerides novae et auctae, the first major ephemeris computed according to Copernicus' heliocentric model, using parameters derived from the Prutenic Tables. Although the Copernican model provided an elegant solution to the problem of computing apparent planetary positions (it avoided the need for the equant and better explained the apparent retrograde motion of planets), it still relied on the use of epicycles, leading to some inaccuracies – for example, periodic errors in the position of Mercury of up to ten degrees. One of the users of Stadius's tables is Tycho Brahe. 1627 – the Rudolphine Tables of Johannes Kepler based on elliptical planetary motion became the new standard. 1679 – La Connaissance des Temps ou calendrier et éphémérides du lever & coucher du Soleil, de la Lune & des autres planètes, first published yearly by Jean Picard and still extant. 1975 – Owen Gingerich, using modern planetary theory and digital computers, calculates the actual positions of the planets in the 16th Century and graphs the errors in the planetary positions predicted by the ephemerides of Stöffler, Stadius and others. According to Gingerich, the error patterns "are as distinctive as fingerprints and reflect the characteristics of the underlying tables. That is, the error patterns for Stöffler are different from those of Stadius, but the error patterns of Stadius closely resemble those of Maestlin, Magini, Origanus, and others who followed the Copernican parameters." For scientific uses, a modern planetary ephemeris comprises software that generates positions of planets and often of their satellites, asteroids, or comets, at virtually any time desired by the user. Typically, such ephemerides cover several centuries, past and future; the future ones can be covered because the field of celestial mechanics has developed several accurate theories. Nevertheless, there are secular phenomena which cannot adequately be considered by ephemerides. The greatest uncertainties in the positions of planets are caused by the perturbations of numerous asteroids, most of whose masses and orbits are poorly known, rendering their effect uncertain. Reflecting the continuing influx of new data and observations, NASA's Jet Propulsion Laboratory (JPL) has revised its published ephemerides nearly every year for the past 20 years. Solar System ephemerides are essential for the navigation of spacecraft and for all kinds of space observations of the planets, their natural satellites, stars, and galaxies. Scientific ephemerides for sky observers mostly contain the positions of celestial bodies in right ascension and declination, because these coordinates are the most frequently used on star maps and telescopes. The equinox of the coordinate system must be given. It is, in nearly all cases, either the actual equinox (the equinox valid for that moment, often referred to as "of date" or "current"), or that of one of the "standard" equinoxes, typically J2000.0, B1950.0, or J1900. Star maps almost always use one of the standard equinoxes. Scientific ephemerides often contain further useful data about the moon, planet, asteroid, or comet beyond the pure coordinates in the sky, such as elongation to the Sun, brightness, distance, velocity, apparent diameter in the sky, phase angle, times of rise, transit, and set, etc. Ephemerides of the planet Saturn also sometimes contain the apparent inclination of its ring. Celestial navigation serves as a backup to the Global Positioning System. Software is widely available to assist with this form of navigation; some of this software has a self-contained ephemeris. When software is used that does not contain an ephemeris, or if no software is used, position data for celestial objects may be obtained from the modern Nautical Almanac or Air Almanac. An ephemeris is usually only correct for a particular location on the Earth. In many cases, the differences are too small to matter. However, for nearby asteroids or the Moon, they can be quite important. Global Positioning System (GPS) navigation satellites transmit electronic ephemeris data consisting of health and exact location data. A GPS receiver can use the transmissions from multiple such satellites to calculate its own location using trilateration. Other modern ephemerides recently created are the EPM (Ephemerides of Planets and the Moon), from the Russian Institute for Applied Astronomy of the Russian Academy of Sciences, and the INPOP (Intégrateur numérique planétaire de l'Observatoire de Paris) by the French IMCCE. ^ "Liddell & Scott Dictionary on Perseus at University of Chicago". ^ "Dictionary − ephemeris". Merriam-Webster. ^ "ephemeris". Dictionnaire Gaffiot latin-français. ^ Jones, S.S.D. ; Howard, John; William, May; Logsdon, Tom; Anderson, Edward; Richey, Michael. "Navigation". Encyclopedia Britannica. Encyclopædia Britannica, inc. Retrieved 13 March 2019. ^ Gingerich, Owen (1975). ""Crisis" versus Aesthetic in the Copernican Revolution" (PDF). Vistas in Astronomy. Elsevier BV. 17 (1): 85–95. Retrieved 23 June 2016. ^ Georgij A. Krasinsky and Victor A. Brumberg, Secular Increase of Astronomical Unit from Analysis of the Major Planet Motions, and its Interpretation Celestial Mechanics and Dynamical Astronomy 90: 267–288, (2004). ^ American Practical Navigator: An Epitiome of Navigation. Bethesda, MD: National Imagery and Mapping Agency. 2002. p. 270. ^ "Almanacs and Other Publications — Naval Oceanography Portal". United States Naval Observatory. Retrieved 11 November 2016. ^ Pitjeva, Elena V. (August 2006). "The dynamical model of the planet motions and EPM ephemerides". Highlights of Astronomy. 14: 470. Bibcode:2007HiA....14..470P. doi:10.1017/S1743921307011453. ^ "INPOP10e, a 4-D planetary ephemeris". IMCCE. Retrieved 2 May 2013. Duffett-Smith, Peter (1990). Astronomy With Your Personal Computer. Cambridge University Press. ISBN 0-521-38995-X. "ephemeris". American Heritage Dictionary of the English Language (3rd ed.). Boston: Houghton Mifflin. 1992. Wikimedia Commons has media related to Ephemeris.